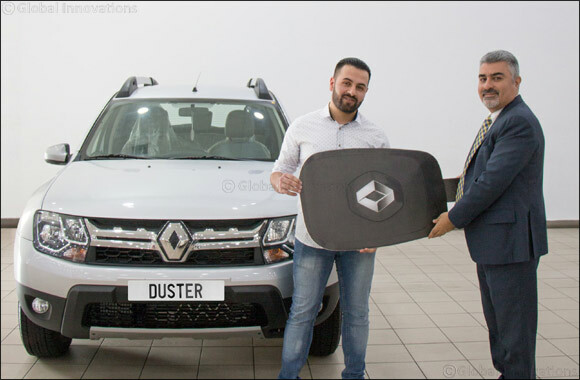 Kuwait –28 September 2018:- Abdulmohsen Abdulaziz Al Babtain Co., the authorized agent of Renault in the State of Kuwait recently awarded Mr. Mohammad Abdul Mohsen AlAbod AlKheder with the Renault Duster 4x4 after winning the World Cup Asdaa Al Aalam competition. Renault Middle East had sponsored the show. The sole winner hailing from Kuwait, Mr. Mohammad Abdul Mohsen AlAbod AlKheder was gifted the keys to his brand new car by Renault Al Babtain Brand Manager Carl Saliba at the Al Rai showroom. Fortunate viewers of the “Asdaa Al Aalam” from all over the Arab region were entitled to win valuable prizes such as the Renault Captur, Renault Duster, Renault Symbol or Renault Koleos by participating through a text message or a call to the program during the show. Renault Duster comes equipped with four-wheel drive transmission, advanced new media Nav 2.0 multimedia system that entertains and navigates while enabling hands-free Bluetooth calling; along with a cruise control system making driving seamless.